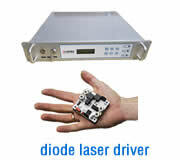 CM series pulsed laser power supply is our latest developed, which is based on a touch screen control of high precision intelligent constant-current power supply. Its internal adopts basing FPGA and ARM embedded system software programming, external with 65536 color LCD display, supported operating via touch and press, provided water temperature, water pressure, lack of phase, over-voltage and other various alarm functions, realized the programming of multiple segmented laser wave-form and parameters, display in real time like oscilloscope. And also provides communication interface and USB interface, which can be easily connected to host computer via serial interface to control the power supply through the USB interface to read the parameters, storage and hardware upgrades. V2.2 version supports remote upgrading function. The user may send machine codes of the equipment to us and the activation codes from inputting feedback into the touch control screen can upgrade the device’s current, pulse width, frequency, maximum power and other configure parameters. 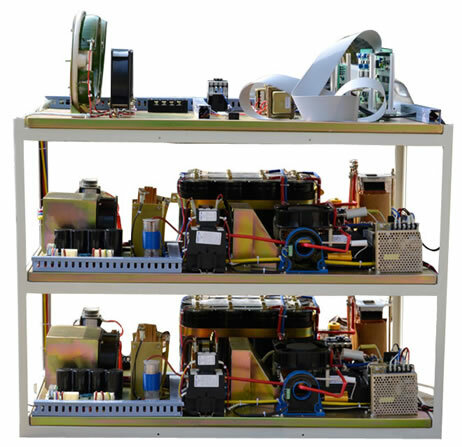 This series pulsed laser power supply, human-machine interface elegant, function powerful, quality reliable, and various technical parameters are leading level in the industry. 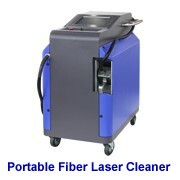 It is the standard pulsed Nd:YAG laser power supply. As indicated in above figure, a pulse can be divided into 32 sections and each section may have its own current and pulse width, and pulse repetition rate. According to different current and pulse width setting in each section, the various pulse waveforms can be achieved. 1) Based on modular circuit programming design, can be used to drive single lamp, dual lamp, four lamps or eight lamps. 2) Based on industrial site date communicate, ensure good anti-interference ability, communication. The distance can be 100m. 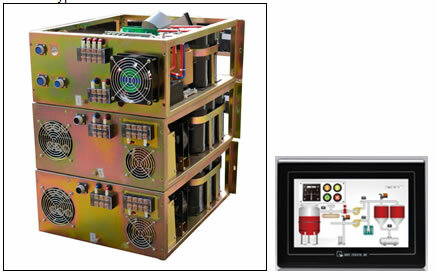 4) The system alarm operate information complete, provide protection for less current, over current, over-load, phase failure and phase sequence fault, pressure over-load, temperature over run, radiator over-temperature, alarm reminding function can real-time display more than 100 fault handling information. 5)With the corresponding interface circuit to achieve 128 sets of parameters continuous light soft hand-over and 64 sets of parameters hard hand-over(soft handover is software control hand-over, can be set in the touch control interface; hard handover is hardware control hand-over, can be controlled by external logic circuit given relative level). 6) The pulse waveform can be set in 32 section wave-form arbitrarily at least. Each section provides current slope rise and fall and the system can save 100 programs for user to be used. 7) From the interface, external control can set the valve to start ahead before laser output or delay time after laser stopped. 8) Intelligent optical switch control. Delay time in milliseconds of time can be customized according to user’s needs, ensuring total blackout. 9) Slowly ascending and descending control can be set by user and current amplitude and starting point can be set for ascending or descending. 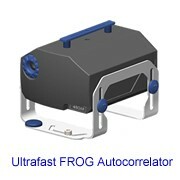 10) Can realize energy real time feed-back, make the output energy stabilization error within ±2%. 11) Current parameter is split into starting current and end current, can set them discriminability, in order to gain more ideal wave-form. The highest current can be up to 600A. 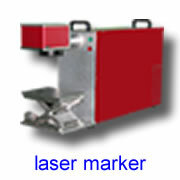 12) Pulse width can realize 0.1ms stable laser output, highest up to 20ms. 13) Frequency highest up to 1000Hz, can alternated light acting on the xenon flash lamp to alternating the light intensity. 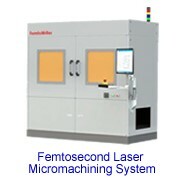 14) Beam control, in the scope of 0.1-0.3mm laser beam control, and have starting up self-motion function, that is when starting up it automatically adjusts to negative limit minimum values. Parameters of step motor adjustable. 15) Support USB testing, convenient for maintenance and debugging. 16) Can edit program in the process of working. 17) Real-time display working current wave-form, can customize process wave-form via dragging the lines. 18) Support power on self test, and report the specific problem of the main chip. 19) Offer remote up-grating model, only need to offer machine code of equipment, parameters can be configured according to user requirements for the upgrade. 8. Display: 65536 high resolution LCD, support touch screen control. 10. Real-time feedback error: less than 2%. 11. 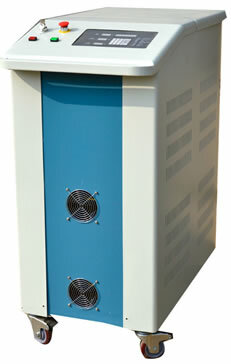 Working environment: input power 3 phase 380V±10%, using at ambient temperature below30℃ drying condition, air dust <0.01g/cubic metres, no condensation.